The 80’s. A time in cinema when you had the biggest action heroes go through hundreds of henchmen effortlessly, spout a one liner, and save the day. They were pretty silly looking back, but they still invoke a kind of dumb power fantasy that is still enjoyable to watch if you turn your brain off. Now how about a company that takes that and turns it into a multiplayer shoot ‘em up, available now on Steam, sound good? Much like the action films of Hollywood, let’s set the scene in Tango Fiesta, before we commence the destruction. You play as John Strong, someone who is retelling his story of his vendetta against Hollywood as well as other people. To no one’s surprise it is a paper thin plot, only used to set a scene for where this is all going to happen. The game wears its influences on its sleeve, going for the cheesy one liners in-between lots and lots of gun play. It emulates the movies of the era perfectly, for better and for worse. 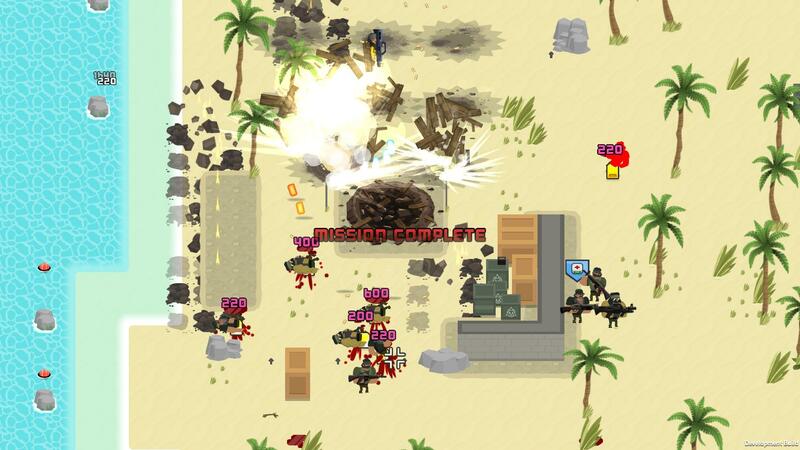 The game is a single or multiplayer experience, whereby you get dropped into a region, blow up or defend set targets, and then you job is pretty much done. Occasionally the end gets delayed by you having to mow down a large crowd of enemies before leaving, or sometimes there’s a boss fight, but that’s as extravagant as it gets. You kill, or avoid as is the case 90% of the time, endless waves of mobs on your way to objectives, which while fun for the first couple of levels, there is very little variety in the form of your generic enemies, and once too many get in a group it becomes a bullet hell as you try to get out alive. They do drop gold, which you can use for weapon purchasing, and health kits to keep you going, but they serve as more of a nuisance than a challenge. 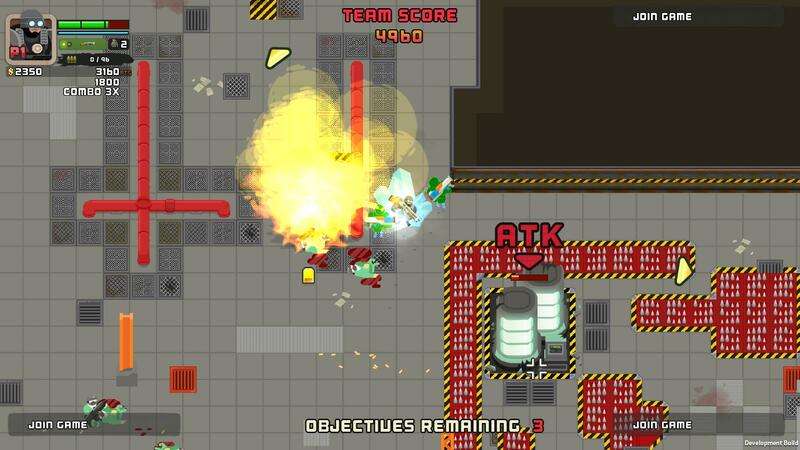 It’s a top-down shooter, again evoking memories of yesteryear, when arcade games like Smash TV and Commando were all the rage, and it plays very much like one. On a controller one stick manages movement, and the other controls your aim. For mouse and keyboard, it’s a regular WASD setup with mouse aiming. But this is where we hit a bit of a problem. You see, Smash TV has an eight way shooting system, due to the sticks it used only being able to register eight different digital directions, whereas here we’re using analogue sticks to aim in the exact same way. So if you’re in between one of the cardinal directions with your aim, it snaps to whichever is closest, which can be jarring and disrupts the gameplay. The game’s art style is a very simple, almost campy style that fits in well for 80’s theme, looking very much like an early Cartoon Network show like Powerpuff Girls, with bright colours and big lines. The animations leave something to be desired though, with very few frames to make anything look smooth, making everything look anaemic and devoid of any life. You do get some choices to compliment your gameplay, as you’re able to choose from a selection of your favourite movie stereotypes on your quest for destruction. Like a Rambo character, a female, a Robocop in all but name, and a regular scientist. Each come with their own stats for things like movement, health etc., but it doesn’t seem to effect the gameplay much at all. You can also pick which weapons you can use, and while some choices don’t seem to make sense, a sub-machine gun has more range than a rifle for example, this at least gives you some variety in your slaughter. However, some of the unlock requirements for later weaponry involves some ridiculous grinding on levels for a minimal upgrade. The game touts procedural generation, a staple of a large amount of indie games in recent years, as one of its defining features. But in my opinion it doesn’t change enough of the game for it to be worth shouting about. Yes, it’s nice that the actual areas you’re in change and the physical placement of your objectives change every time. But without any sort of proper enemy variations, the gameplay loop doesn’t ever change, leaving me to wonder why this such a good feature? 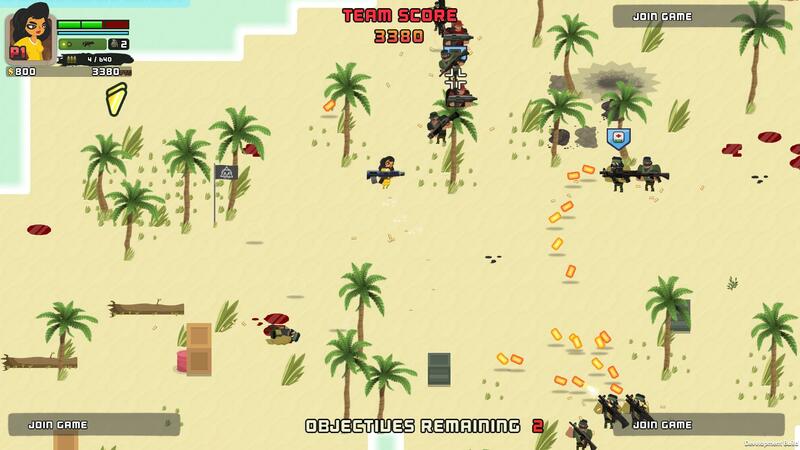 To summarise, Tango Fiesta is a decent shot at a co-op top down shooter, with replayability in the form of its procedural generation. But it’s lacklustre gameplay, anaemic animations and janky controls, it’s not my first choice for 80’s over the top action gameplay with my friends. For that, we have Broforce, and while it isn’t a top down shooter, it’s way more over the top and infinitely more enjoyable than this. This entry was posted in Uncategorized and tagged Mastertronic, Spilt Milk Studios, Steam, Tango Fiesta. Bookmark the permalink.